Rt. Hon. Lord Brassey. K. C. B. Was born at Staf­ford in 1836, and educated at Rugby and Oxford. He entered politics in 1865, being elected as Liberal member for Devonport, Represented Hastings from 1868 to 1886. At the General Election in the latter year he was defeated at Liverpool, and it was shortly after this that he was raised by Mr. Gladstone to the Peerage. Lord Brassey’s life has been devoted to work, and no politician was more fitted for a Parliamentary career than he. Author and statesman, as well as keen sailor, he devoted his energies to those naval, economical and labour questions so dear to his heart. His speeches on naval questions are still famous, and their effectiveness in practical application is found in the Navy of to-day. 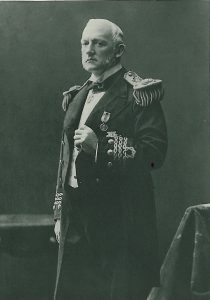 He induced the Admiralty to establish the Second-class Naval Reserve, to include the enrolment of the fishing population, and he was instrumental in estab­lishing the Royal Naval Artillery Volunteers. In 1874-1875 he served on the Royal Com­mission on Unseaworthy Ships. In 1880 he was appointed in the Liberal Administration as Civil Lord of the Admiralty, and four years later as Secretary to the Admiralty. Turning from his Parliamentary career to that of author, we find his five volumes, ‘The British Navy,’ as the standard work on naval matters. He is also the author of ‘Work and Wages, ‘English Work and Foreign Wages,’ Lectures on the Labour Question, ‘British Seamen,’ and a number of other famous volumes on labour and economics. It is as sailor that Lord Brassey has gained that wealth of experience which entitles him to first place among our nautical experts. 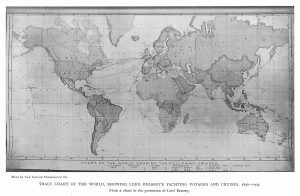 Tract Chart of the world, showing Lord Brassey’s yachting voyages and cruises, 1856-1905. In his early voyages he applied himself to the study of navigation, and so succeeded in obtaining from the Board of Trade a master’s certificate, the first granted to any yachtsman. It is in the voyages of the Sunbeam in all parts of the world that Lord and Lady Brassey have become household names in this country. Lady Brassey was the daughter of Mr. John Allnutt, of Charles Street, Berkeley Square, and it was she who was in large measure partly responsible for the fame into which the Sunbeam was brought. In a pathetic memoir in The Last Voyage of the Sunbeam, ‘Lord Brassey tells of the origin of Lady Brassey’s famous log. Through­out the voyage Lady Brassey was in the habit of writing to her father a narrative of passing events, and it was this collection of letters which formed the basis of a book which brought fame to her name. 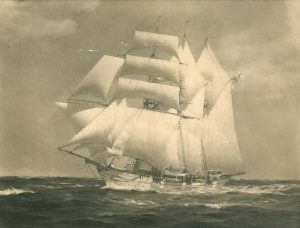 Lady Brassey died at sea on September 14, 1887. Three years later Lord Brassey married the youngest daughter of the late Viscount Malden, sister of the present Earl of Essex. Lord Brassey has travelled in all parts of the world. He has made voyages in the Mediterranean as far as Constantinople in 1874 and 1878, Cyprus in 1878, and Egypt in 1882 ; voyages to Norway in 1856, 1874, and 1885, and on the latter occasion entertained the late Mr. Gladstone and his family ; voyages to Holland in 1858 and 1863 ; round the world in 1876-1877 ; India, Australia, and the Cape in 1886-1887 ; and to Calcutta in 1 8 93. Other voyages include the West Indies in r: 3 and 1892, Canada, the United States, and the Baltic. The greatest distance covered in a single cruise was, of course, in the circum­navigation of the globe in 1876-1877, when 37,000 knots were registered. Just ten years later, in 1886-1887, 36,466 knots were regis­tered in the voyage to India and Australia. Lord Brassey has owned the following yachts since 1854: Spray of the Ocean (8-ton cutter), Cymba (50-ton cutter), Albatross (118 tons), Meteor (164.-ton auxiliary schooner), Muriel (6o – ton cutter), Eothen (340- ton steam yacht), Sunbeam (532 tons), Norman (40-ton cutter), Lorna (9o-ton cutter), Zarita (115-ton yawl). Clubs: Royal Yacht Squadron, Royal Albert, Royal Cruising, Castle, Imperial German, Island Sailing, Royal Mersey, Ports­mouth Corinthian, Royal Southern, Royal Thames, Royal Victoria. Residence: 24, Park Lane, W.